Summary: Learn how to build a barbeque, build a bbq, build a barbecue, prepare a position and lay the bricks. Barbeques built in brick have become very popular. The positioning of the barbeque will need to be thought through carefully before you start building. It is not a good idea to have it in direct view from the house or somewhere too remote. The size of the brickwork frame you will be constructing will be determined by the size of the grill and charcoal pan, so purchase these first. For convenience build it reasonably close to the kitchen. Safety is a major consideration, so position the barbeque away from fire hazards such as fences, trellis, hedges and trees. Before you begin to build the structure, a firm and level base is essential. This is best achieved by positioning the barbecue on a patio. If this is not possible, then a concrete foundation will be required. 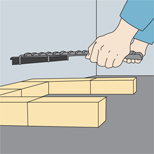 Once you have a level surface lay the bricks without mortar in a double L-shape. 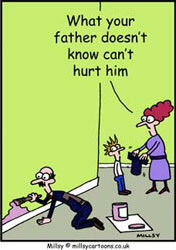 By doing this, you can check that the corners are perfect right angles, and that the charcoal pan will fit as required. Use chalk to draw around the laid-out bricks and move the bricks out of the way. Once you have a level surface lay the bricks without mortar in a double L-shape, check the corners are perfect right angles, and the charcoal pan fits. Add water until you get the correct consistency. Using a brick trowel put down a layer of mortar in the chalked outline of the barbeque. 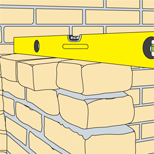 Lay the first course of bricks on top of the mortar, using a builder's square to check the corners are still at right angles. Use a spirit level to make sure this first course of bricks is level. Apply a bed of mortar to the top of the first course of bricks and lay the second course, staggering the brick joints. Continue to lay courses whilst periodically checking the bricks are level. You can also check the sides of the walls are even using a plumb line. The charcoal pan is usually fitted at the height equivalent to six or seven courses. On reaching this height lay three bricks on each side of the wall at right angles, so they stick out of both sides. These bricks will support the charcoal tray. Do the same again after you have laid another course of bricks (or two courses, depending on which you prefer) for the grill to rest upon. 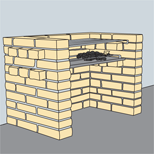 To vary the height of the grill, you can set metal rods in the mortar, between two or more courses of bricks. Then build another two courses of brick on top of the highest grill setting. If the barbeque is in an exposed position, you may wish to build the wall on each side even higher to help block out the wind. ON reaching the sixth or seventh course lay three bricks on each side of the wall at right angles, so they stick out of both sides to support the charcoal tray.